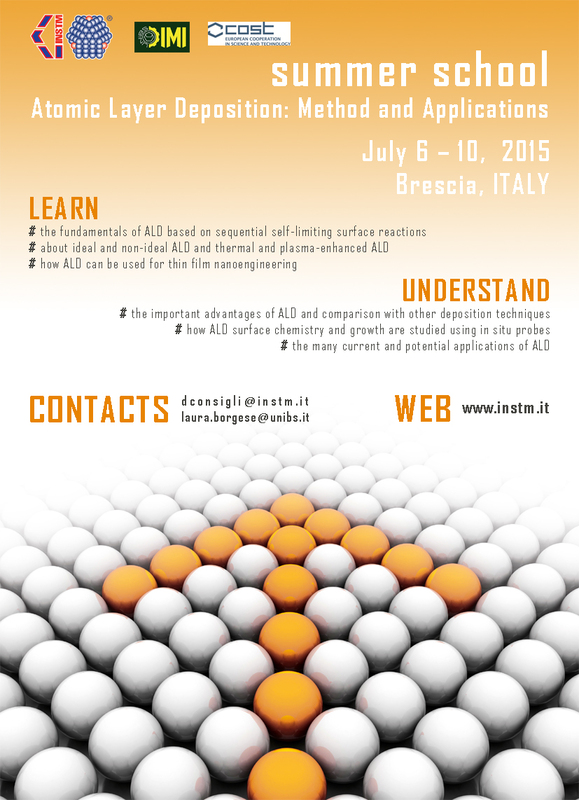 Summer school "Atomic Layer Deposition: Method and Applications"
learn about ideal and non-ideal ALD and thermal and plasma-enhanced ALD. The Summer school is organised into lessons, seminars and thematic work sessions. Lessons will take place in the morning from 8:30 to 12:30. All the physical, chemical and engineering concepts of ALD will be revised, by illustrious scientist. Seminars dedicated to one main theme of application will be held by scientist leader in the field in the early afternoon from 14:30 to 16:00. Thematic work sessions dedicated to the theme faced during the daily seminar will take place in the late afternoon from 16:00 to 18:00. Five minutes presentation of posters or slides from students are encouraged to discuss the main problems of material synthesis and characterization in the selected field. Detailed program and speakers will be available soon. Registration fee is 500 euro (VAT included). Registration includes: courses material, coffee breaks, 5 lunch, 5 dinner. Payment may be done via bank transfer or credit card (VISA or MASTERCARD) as specified in the registration form. Deadline for registration and payment is 20th June 2015. Limited number of fellowships supported by COST Action HERALD will be available for early registrations. Deadline is 31st May 2015. The names of selected fellows will be communicated within 15th June 2015. Please note that, in order to be able to request the fellowship, you have to send the fellowship application form together with the registration form duly signed and filled-in in all the sections (registration, payment, invoice). The selected fellows will be later reimbursed by the HERALD Cost Action according to its rules. Places in double rooms are available at Casa Marcolini Facella. Accomodation cost is 41 euro per day per room (20,50 euro per person). Breakfast is excluded. Info: info@casamarcolinifacella.it.